Located in Aachen, just on Germany's border with Belgium and the Netherlands, Hotel Pullman Aachen Quellenhof is a historic hotel with a rich history of providing spa-focused services to its guests. The Hotel Palast Aachener Quellenhof was built in 1916 with a neoclassical façade and surrounded by beautifully-sculpted public gardens. Though the structure was largely destroyed during World War II, the building has since been completely restored. Over 100 years after it first opened its doors, this five-star hotel is still in operation and continues to offer a generous, spa-like atmosphere where guests can relax and rejuvenate. The architect Anna Maria Jagdfeld designed the interiors, preserving the long history of the building by using high quality materials to implement a generous and timelessness flair. Throughout its years of operation, Hotel Pullman Aachen Quellenhof has had many different room arrangements; currently, the hotel offers 181 elegant and inviting guestrooms and suites. 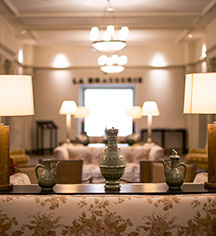 Both business and leisure travelers will enjoy the hotel's warm ambiance and plentiful amenities, including the expansive spa and fitness areas, 13 event and meeting spaces, and the colonial-style Elephant Bar. This hotel is an excellent choice for those seeking an easy gateway to travel and a relaxing atmosphere just outside of Aachen's city center. Guests will enjoy walking the grounds of the City Garden Aachen, located just beyond the hotel's doors. First founded as a Roman settlement and spa, the city carries the spa life tradition on today. Guests to this romantic German city will discover Aachen Cathedral, a UNESCO World Heritage Site, thermal fountains, and a tradition of fine foods. 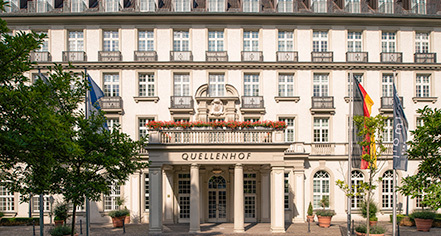 Hotel Pullman Aachen Quellenhof, a member of Historic Hotels Worldwide since 2018, dates back to 1916. Many famous guests have stayed at the hotel including Prinz Bernhard of the Netherlands, King Juan Carlos of Spain, and British Prime Minister Winston Churchill. Airport Transportation: An airport shuttle may be arranged through the hotel's concierge for €80. Cancellation Policy: Cancellations can be made free of charge until 6pm on the same day for individual bookings. Early Check-In/Late Check-Out: Available, depending upon availability. A €20 applies. Hotel/Resort Fees & Taxes: VAT is included in rates. Occupancy Restrictions: Varies by room type. A maximum of 2 adults + 1 child in superior or luxury rooms is allowed. Parking: On-site parking is available, €14 for outside parking and €16 for underground parking. Payment: Vissa, MasterCard, Amex, Diners Club, and cash are accepted. Pet Policy: Dogs are allowed with a €15 fee. Rollaways: Available upon request for a €35 fee; only for use by children. Located in Aachen, just on Germany's border with Belgium and the Netherlands, Hotel Pullman Aachen Quellenhof is a historic hotel with a rich history of providing spa-focused services to its guests. The Hotel Palast Aachener Quellenhof was built in 1916 with a neoclassical façade and surrounded by beautifully-sculpted public gardens. Learn more about the History of Hotel Pullman Aachen Quellenhof .